1. Yaxley has a ridge on his muzzle. Call it a cowlick or a Rhodesian ridge-nose or whatever you want. A little line of fur on top of his nose is growing in a different direction. Went we brought him home from CCI, I spent the first couple of days trying to rub that funny little smudge off before I realized that it was indeed a permanent part of him. That's right, it took me two days to figure that out. Think of the mom spitting into a tissue and rubbing dirt off her kid's face. It was kinda like that. 2. He has three black nails and one clear on each front paw. 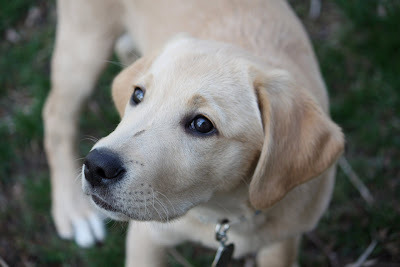 Yaxley is a 50-50 lab/golden cross. His mother is the beautiful Keara, a golden retriever, and dad is a black lab, Hickman. I won't even try to bluster my way into pretending I understand a thing about canine genetics. Coat color, dudley noses, toenail color and all that. 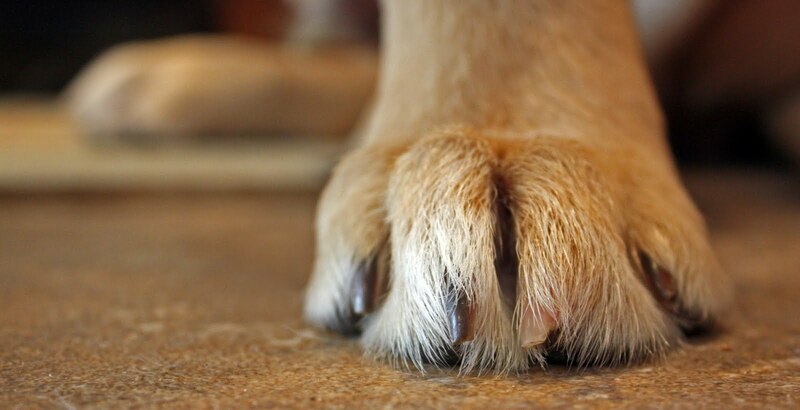 I'll just say that black toenails on a pup are not my favorites on grooming day. Dog Toenail Clipping for Dummies is not the book I need to have on hand. I need the one for klutzes. 3. He is from a litter of eleven. The Yuletide Y Litter was born on December 22, 2010. Breeder/caretaker Susie Nash is absolutely awesome - in the purest sense of the word. 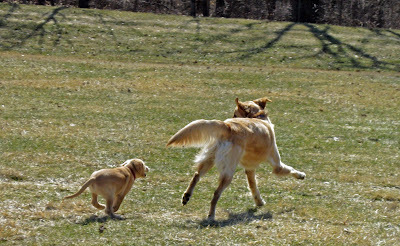 She whelped this litter and cared for the newborns until they were eight weeks old and ready for their puppy raisers. Yaxley showed up crate trained, responding to his name and following the Sit and Here commands. And much more that is making my part of puppy raising so much easier. And she made this magic with eleven puppies. During the Christmas season. 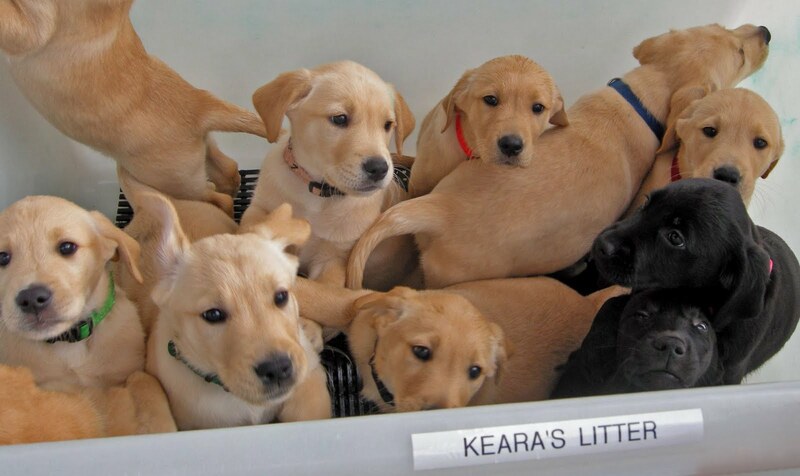 Each pup in a CCI litter shares the same first letter for their names. The Y's ready for their health check by the CCI veterinarian. Nine yellows and two blacks. 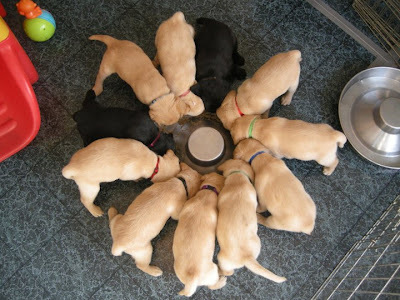 Six male puppies, five female. 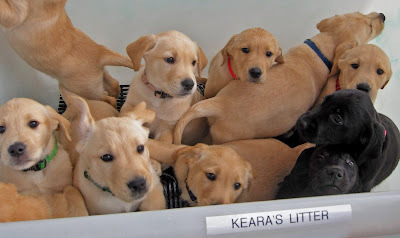 In the photo above, Yaxley is the pup in the green collar on the far left. 4. 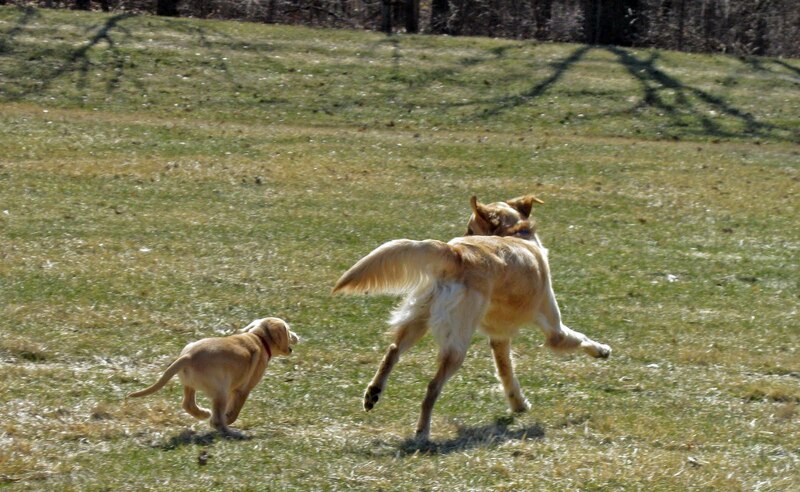 Yaxley is not afraid of running with the big dogs. He is, however, concerned with being run over by the big dogs. During some energetic play sessions, he'll hang back and use me as his personal bodyguard by sitting between my feet. Like the kid brother who wants to join the football game, but knows he'll just get creamed out there. Now this isn't a lack of confidence, you know. This fellow can strut through a new situation with his tail held high. Bring it on, World, he says, I'm ready for ya. It's more of an awareness of self-preservation. 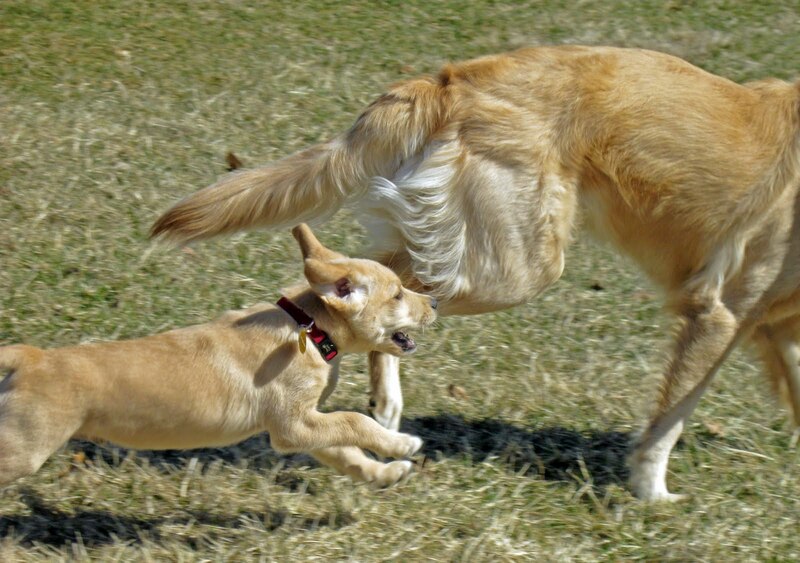 Any ordinary puppy would be right out there joining the melee - and doing gymnastic-style somersaults with every impact. It's the clever ones that can analyze the situation and know when the odds are not in their favor. And Yaxley is one smart little puppy. He's adorable as well! My baby will be for months at the end of the week! They grow so fast!